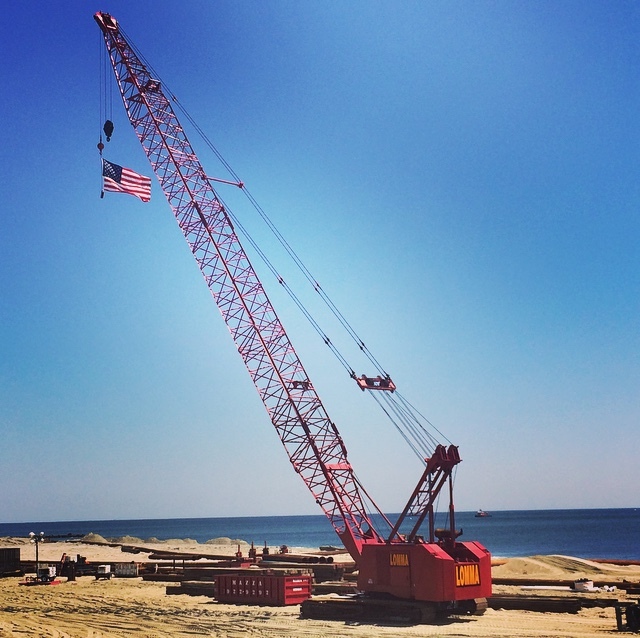 With the devastation of Hurricane Sandy and the loss of beachfront along the New Jersey coast line, Governor Christie, along with the Army Corps of Engineers (ACOE) and in cooperation with the NJ State Department of Environmental Protection, developed a plan to replenish the beaches from Sandy Hook down to Cape May. After much delay, the ACOE finally began the replenishment process in April of this year. Originally, the ACOE intended to notch all of the jetties on the beachfront, but the Board of Commissioners and the Borough Engineer protested successfully and the Army Corps decided against notching. Additionally, as part of the original replenishment project, the ACOE and it’s contractor were obligated to extend the Borough’s well points and outflow pipe to assure that the Allenhust Beach Club would have a functioning pool by Memorial Day. The Borough repeatedly asked the Army Corps representatives for their plans demonstrating how and when the extension of our pool well point system would be accomplished, but we never received those plans. Finally at the end of April, the Borough was, for the first time, orally advised that the ACOE contractor planned to spend eight weeks doing construction to extend the well points. The plan would have required the majority of south beach to be fenced off while a crane suspending a pile driving hammer drove wooden piles into the sand. Of course, the Borough of Allenhurst objected o this plan, and even threatened to sue. The Army Corps then consented to set up a temporary well point system for the summer so as to postpone the extensive construction. Unfortunately, this system proved to be defective, and we have now learned that the ACOE’s efforts have damaged our existing system. For now, the Army Corps has rigged up a pump and hose to fill the pool for Memorial Day weekend, and possibly the next weekend, and they have advised us that they will continue to work on putting in a temporary well point system in place for the remainder of the summer season. This is what you will be seeing on our beach. If the ACOE fails to put in a functioning system by the end of the month, the Board of Commissioners is prepared to hire its own contractor to ensure we have a functioning well point system for the remainder of the summer. The Board of Commissioners has been diligent in their attempts to make the Army Corps of Engineers and their contractors honor the terms of their contractual agreement, and they will do whatever necessary to ensure a functioning pool for the Beach Club. We’d like to tank you in advance for your patience in this matter, and apologize for any inconvenience this may cause our members and guests.